In 'A Ghost Story,' A House Is A Home For All Time Casey Affleck and Rooney Mara star as a couple on opposite sides of a divide that should part them — but it doesn't, quite. Recently deceased, a ghost (Casey Affleck) returns to his suburban home to console his bereft wife (Rooney Mara). 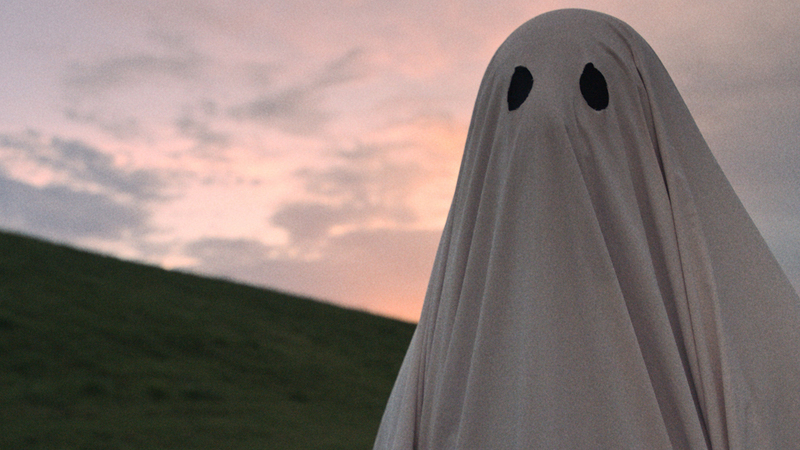 Through much of A Ghost Story, Casey Affleck or a stand-in plays a dead soul, draped in a sheet with cut-out eye holes. This low-budget approach to the supernatural might suggest that writer-director David Lowery is playing a Halloween trick on movies that take the paranormal seriously. Except that he opens the tale with a line from "A Haunted House," a story by Virginia Woolf, not Stephen King. Woolf liked to write from the viewpoint of homes — she also did it in To the Lighthouse — so perhaps that's why Lowery invokes her. Most of A Ghost Story is linked to the shabby Texas ranch house where a young couple lives for a short time. Their story (and what comes later) is presented in an almost-square format with rounded corners, as if the footage is a vintage home movie. Identified in the credits simply as M (Rooney Mara) and C (Affleck), the two are happy together, more or less. Then C dies in an off-camera car crash. M leaves fairly soon after her mate's death. But C, reborn as a ghost, trudges back from the hospital morgue to the house, where he lingers after M departs. Lowery hints that C is anchored to the spot by having him make contact with another ghost who lives next door. In silent but subtitled conversation, the other spirit professes to be waiting futilely for someone to return. That's how it is for ghosts, apparently. At first, it seems the movie's themes are loneliness and lack of communication. The bereft M wanders the house, communing only with a pie that she — in the movie's big acting moment — joylessly wolfs down while sitting on the kitchen floor. The late C, now something of a poltergeist, tries to get her attention, but without success. Lowery posits a world in which time can move both forward and backward, and can spin like a top. In the various scenarios the filmmaker sketches, the house is torn down, hasn't been built yet, or is home to M and C once again. Or forever. Among his inspirations, Lowery has said, are Asian directors Tsai Ming-liang and Apichatpong Weerasethakul, both known for slow, melancholy meditations. But once M leaves, Lowery commences what look like homages to fellow Texans Richard Linklater and Terrence Malick. In the first, a party filled with alt-rock hipsters is dominated by a garrulous guy (Will Oldham, a musician who's recorded under pseudonyms including Bonnie "Prince" Billy) who recounts the tale of the expanding universe from Big Bang to final deflation. This rap plays into A Ghost Story's sense of cyclical time, but also resembles an episode from Waking Life, Linklater's ode to college-town chatter. Later, a lurch into tomorrow introduces a futuristic high-rise city that's apparently being built on the site of M and C's old place. This sequence is a lot like the final chapter of Malick's Tree of Life — if it had featured Sean Penn under a sheet with cut-out eye holes. Vague enough to read as either moving or meaningless, A Ghost Story relies heavily on music. The catchiest hook is Beethoven's, but most of the score is by Daniel Hart, who contributes morose chamber music and one of those ghastly fake-soul songs — attributed to C, a musician — that pairs spare synth riffs with strangled falsetto. It's the kind of tune that could make you want to move out.